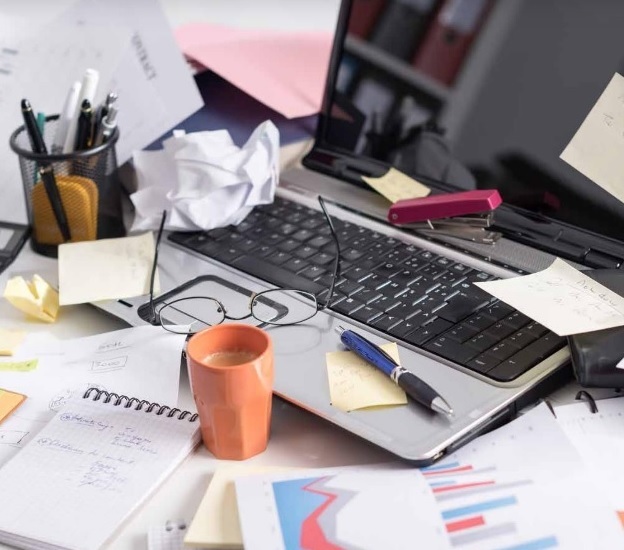 How does it make you feel to walk into a disorganized space in your home or office? — to think about trying to find something in there, or having to work in there? Overwhelmed? Anxious? Sad? Stuck? We hear those answers a lot in our professional organizing work. Now, what about feelings like humiliation, embarrassment, or shame? It gets pretty heavy when we stop and reflect on it all. We often judge ourselves so harshly and suffer so greatly under the weight of negative thoughts and feelings. Our organizers witness a lot of self-judgment within our clients and I’m here to tell you… that self-criticism and judgement do not have a rightful place. We all know that historically women have been chiefly responsible for the unpaid house work, which includes creating and overseeing the organizational systems within a home. Until around the midway point of the last century, women had the time to hone their skills and become the undisputed master of the home front. But times have changed, and so have gender roles. From the early 1950s to today, Canadian women’s participation in the workforce has risen from 25% to 82% (1), and the majority pursue higher education. 2017 figures show that 60% of post-secondary students in Canada are female (2). Sociologist Arlie Russel Hochschild discovered that for most working women there was “The Second Shift” of housework that was waiting for them after their paid shift after work was complete. With more to do and no more time or energy to do it, something had to give. A natural result of all the professional advancement for women combined with the large amount of housework still required of them, is that they have had ever-dwindling time available to devote to becoming experts in organization. Think about it, the essential tasks that are going to get priority are the non-negotiable ones: laundry, meals, shopping, cleaning, birthdays, holidays and driving the kids to their afterschool programs. The seemingly non-essential tasks must naturally get dropped. Additionally, being organized for a lot of women falls under the category of “personal needs” and when life gets too busy, whose personal needs usually get lost in the abyss? – moms. Over the past 50 years as women have joined the working world, the time afforded to women to develop “organizing” skills has decreased dramatically, while expectations to have the picture-perfect, “ready to host”, organized home are now higher than ever. It is so rare for us to come across a client who unapologetically hires our expertise. In fact, I can only think of one. It was so refreshing to witness a woman give herself the rightful permission to not to be perfect at everything, without belittling or scorning herself. She poured her available energy into her career and her partnership and she knew that this was enough. She was proud that she did the things in her wheelhouse with excellence. And as for the rest of things she did not excel at, she refused to let them affect her self-worth; she would accept them and get help from experts. This invisible call for women to “do it all” is very clear in the woman who has chosen to hire a house cleaning service for the first time but feels she has to keep that information from certain friends or family members because they are anticipating the “you can’t do it all yourself?” judgement. Women ought to be on the same team – not silently police and pressure one another to “do more, do more, do more”. I know in my bones that women who decide to outsource anything to experts aren’t lazy women with poor work ethic – on the contrary they are working hard being experts at other important things. The real problem is that the expectation that each woman should have the capacity to be their own expert for everything has not been critically examined. One of the most heartbreaking things for me to witness in my business is when a woman knows for herself that she needs our support; she goes through the entire intake, consult and estimate process, and then at the last stroke of midnight her partner chimes in and says that he thinks she should do it on her own. It breaks my heart to witness a woman assert her needs, only to be usurped by someone who is removed from the problem and unwilling to be part of the solution. I see a women’s own sense of her needs being invalidated and replaced with the suggestion that she should find it easy to do it herself. Both genders, but especially men, underestimate the complexity of the labour and skills required to organize: the mental focus, decision-making, creativity, problem solving, physical exertion and emotional work. People assume that organizing is easy and that it can get done quickly. For organizing work to be truly sustainable it needs to be thorough. Even for experienced, hardworking experts who love the work, it still takes a respectable about of time. The plain truth is, if you have no firsthand experience with the work, you are bound to undervalue it, which is common for a lot of husbands. Something else that is invisibly contributing to the undervaluing of organizing works is that because this household labour used to be done “for free”, by stay-at-home wives and mothers, the assumption is that is not financially valuable. Social scientists have coined the term feminized labour. These are jobs that are paid and valued less across the board simply because the work is completed by women. When women started entering the workforce the dominant thinking was that they did not need to earn a “family salary” because they should have a husband to that. It was thought that women, being used to not being paid for housework, would be satisfied earning a bit of pocket money or extra vacation money. These historical understandings still underwrite the way we value the different kinds of work that is done along gendered lines. So, women, the next time you are being nasty to yourself because you are not adding up to an expectation, step back and remind yourself that times have changed, and we’ve not had the time to stop and critically examine the changes over recent history that highlight the absurdity of those expectations. The truth is – you are not falling short, you are soaring high. All this time you’ve been working hard to rock the things in your wheelhouse and for that, you should feel only self-acceptance and pride.